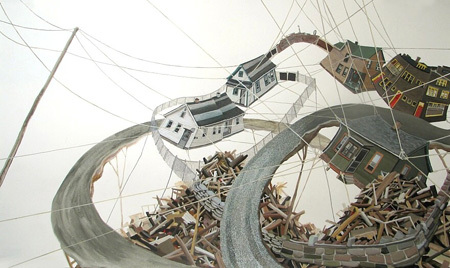 I highly recommend you spend some time visiting Amy Casey’s incredibly impossible (impossibly incredible?) painted worlds. You won’t regret it. 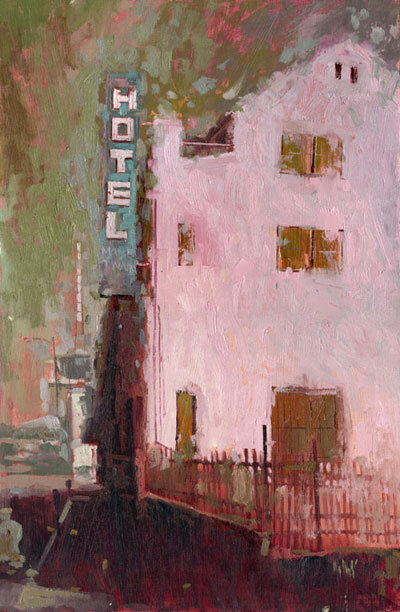 William Wray is painting as fast as he can to capture his favorite locations in California before they are renovated beyond recognition. Personally, I think he’s capturing a sense of light at least as effectively as he is capturing a sense of place. Very cool work. 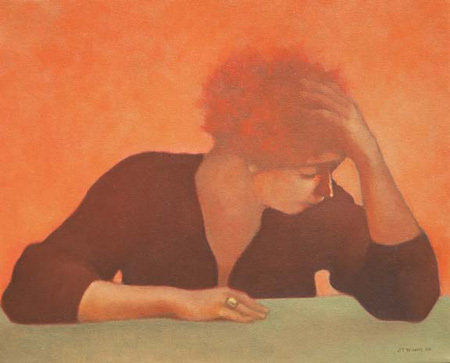 J. T. Winik paints her figures with a muted colour palette and a sense of narrative that I’m enjoying quite a lot. 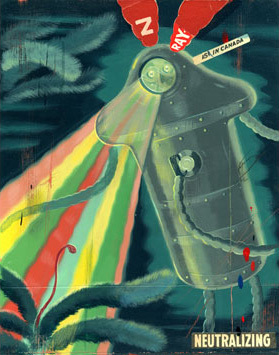 1950’s sci-fi inspired artwork? Sign me up! Head on over to Ryan Heshka’s site for some great imagery that is way more fun than I had hoped to have today. New Jersey artist Mark Oberndorf is doing something of a community service with his work by preserving endangered landscapes in his paintings. He’s also participating in a contest that I find very interesting; apparently, a car insurance company in New Jersey has decided to turn the highways into gallery space by putting artwork on billboards. While I have a hard time not being skeptical of insurance companies in general, I do think this is a potentially great thing. I wouldn’t mind seeing a little more art and a little less advertising on the billboards around here. Combining his architectural background with a healthy defiance of all known laws of physics Mitchell F. Chan creates images of fantastic buildings in his paintings. Just don’t expect them to pass building code inspection. The next best thing to taking a road trip yourself might just be spending some time on Drew Deane’s site. 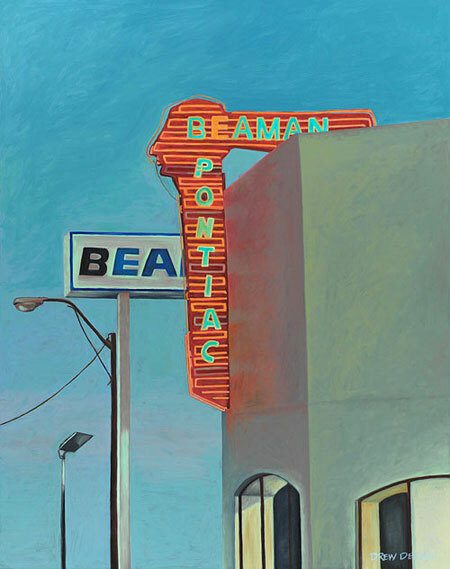 Her paintings of old neon signs are fantastic! 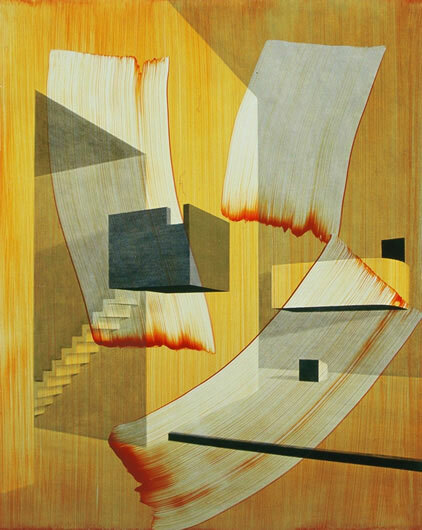 Looking at Peter Verhaar’s work often feels as though you are seeing two paintings rather than one. There is the top layer, that very much calls attention to the act of moving the medium around with a brush, and beyond that lies the more formally constructed image. 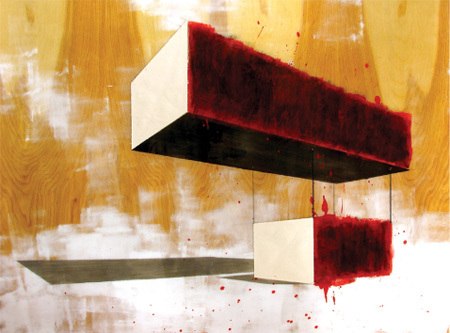 These two layers play off each other, creating a dialogue between the two distinct approaches. Great work! Thanks Anne Marie for the link! 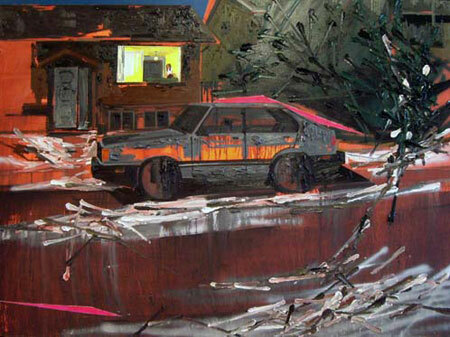 With a thick and varied method for applying paint, Kim Dorland examines, among other things, the boredom of being young with nowhere to go and nothing to do. High school me identifies strongly with that feeling, adult me loves the paintings. Thanks Matt for the link! 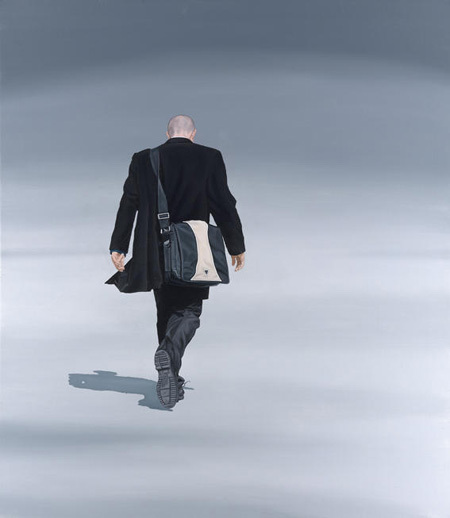 Nigel Cox refers to his style as “Photorealistic Minimalism” which seems like an accurate description. His figures are full of finely rendered detail, yet exist in ethereal voids. The contrast between these elements makes for some fantastic paintings!